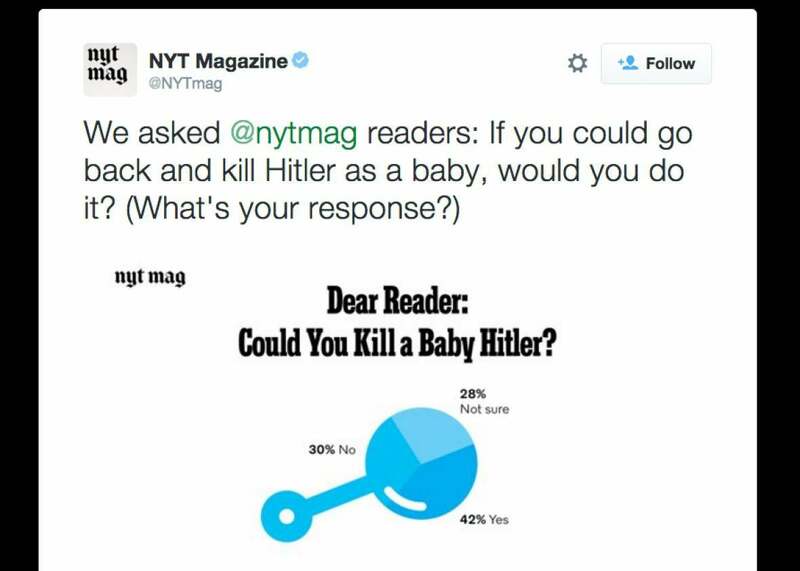 Baby Hitler poll in the New York Times Magazine: Media trolling at its best. Why is it always "kill the baby Hitler" and not "find him as a young man, tell him his art is really good, he should stick with it"
It was great. If Twitter can often feel like a cauldron of bad opinions and stressful newsflashes, sometimes days like this redeem it: when the Internet seems to rise up as one—half in earnest and half in jest, the baby Hitler outrage mingling with the jokes about baby Hitler’s baby moustache—to comment on something so deeply pointless that the whole news cycle seems to collapse. Like all great equalizers, Baby Hitler flattened pecking orders and erased party lines; it left the Internet giddy and exhausted with itself. Baby Hitler turned out to be a perfect phrase-meme: ridiculous-sounding but nicely visual, simple and intelligible enough that it easily shapeshifted to accommodate every other dumb recent internet mania, from pea guacamole to anti-vaxxers to pizza rat. The “what if you could time travel to kill Hitler” hypothetical is an old and well-trod one, but the Times Mag’s execution was sly. Sure, it was trolling, but the savviest kind of trolling: a strategic way of ginning up the exact kind of artificial conceptual binaries that tend to rile people up on Twitter, of inviting people to eyeball a proposition and swiftly pick a lane. In fact, the Times Mag’s “Dear Reader” feature as a whole—a recurring poll that poses questions with minimal context and invites readers to choose one of several answers—might be the most impressive example of mainstream media Twitter trolling we have. Recent “Dear Reader”s include “Is spanking okay?” (Spanking present-day kids, that is, not Baby Hitler: 32 percent said “Yes”; 68 percent said “No”) and “Do you think human beings are truly suited for monogamy?” (“No,” 46 percent; “Yes,” 54 percent). Sometimes “Dear Reader”s are provocative in a plaintive way: “How many times have you been in love?” Every publication is looking for ways to provoke readers into engaging with them without weirding out said readers by wrecking their brand. “Dear Reader” strays gently from the Times brand in a way that seems less like a gaffe than like side-eye at the idea of the Times brand. It uses the authority of the Paper of Record to smuggle in a thought exercise that feels as absurd as it does self-aware. Sometimes “Dear Reader”s are framed with Timesian politesse: “How often, if at all, do you swear or curse in conversation?” (“Occasionally,” said 61 percent.) Sometimes they seem written by third-graders for an audience of more third-graders: “Have you ever ridden one of these animals?” (Horse, 90 percent; camel, 28 percent; elephant, 22 percent; dolphin, 5 percent). But they are always a little startling and always appealingly blunt. And they always require you to slot yourself into one of several arbitrary-seeming camps in a way that is oversimplified to the point of meaninglessness, but—especially when you are scrolling through a Twitter feed full of far messier provocations—satisfying, too.